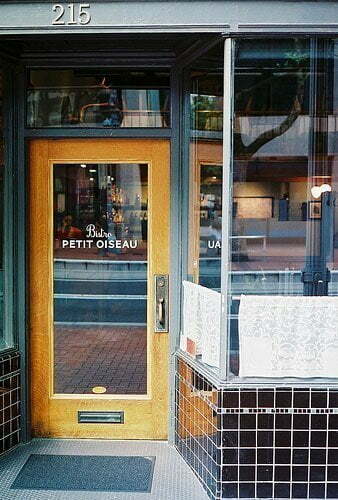 Little Bird – is the child restaurant to Le Pigeon, one of the most highly regarded restaurants in Portland. In 2011, Owner Gabriel Rucker won the “James Beard Rising Star Chef Award – Age 30 or Younger” and in 2013 he won the “James Beard Award Best Chef Northwest”. Justifiably, the restaurant has a large, passionate following. The cuisine has been called French fusion and modern French – I think the latter best describes it, though there are some dishes that are true to the classic cuisine, such as crispy sweetbreads, cassoulet, and roasted marrow. The ambiance is warm and inviting. Wood floors, light green walls with darker accents, red banquets, and a nice tin ceiling. It all works very well, and conforms to the traditional idea of a French restaurant. The tables are pretty close together, which can make it loud on busy nights, but if you go at lunch or for an early dinner it won’t be an issue. To be honest, I wasn’t a fan of this restaurant when it first opened in 2010, but recent experiences have shown that it is now an equal to parent restaurant Le Pigeon, and occasionally surpasses it. I always begin my meal with the Charcuterie – currently chicken liver mousse, blood sausage, smoked pork tenderloin, and foie gras brûlée. The salads are generally quite good. It is hard to go wrong with the Butter Lettuce Salad. Not long ago it was paired with watermelon, this week it is with garlic-artichoke dressing, capers, and parmesan. Other hits include a lovely Salmon Carpaccio with radish, avocado, pea shoots and grapefruit, and the Onion and Gruyère turnover with squash pureé, chanterelles and sage brown butter. The various trout preparations are also a good choice; the latest version is grilled, with a smoked trout and chestnut stuffing, perfect for a cool fall evening. The Le Pigeon burger is a Portland legend, but it was only available in limited numbers. Little Bird offers it as a regular menu item. If someone in your party is averse to French food, this is an excellent alternative. Don’t miss pastry chef Nora Antene desserts; they are some of the best in the city. 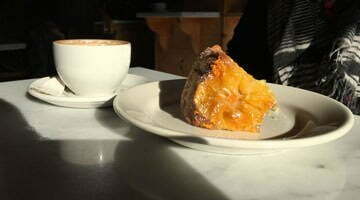 Try the Apple & Fig Tarte Tatin, or any of the chocolate choices – currently Chocolate Île Flottante. The lunch menu smaller, but still has a wealth of options. Between 3pm – 5pm, and 10pm to midnight, only the “Late Hour” menu is available, but they too have a good selection of choices. The restaurant doesn’t have an overabundance of vegetarian options, but what they have are good, including at least two salads and the terrific Onion and Gruyère Turnover. Overall, I like Little Bird. Its wine list is approachable, cocktails and beer better than average, the service is excellent, and the prices are in line with the quality of the food.